The Isle of Wight Biscuit Company : We are going nuts for the Isle of Wight Red Squirrel Trust! The Isle of Wight Biscuit Company, based at Mackett's Farm in Hale Common, has supported the Isle of Wight Red Squirrel Trust for over 10 years. Each year the Isle of Wight Biscuit company donate 10p per box sold of their popular Red Squirrel Ginger biscuits and the donation for the past year was for £400. 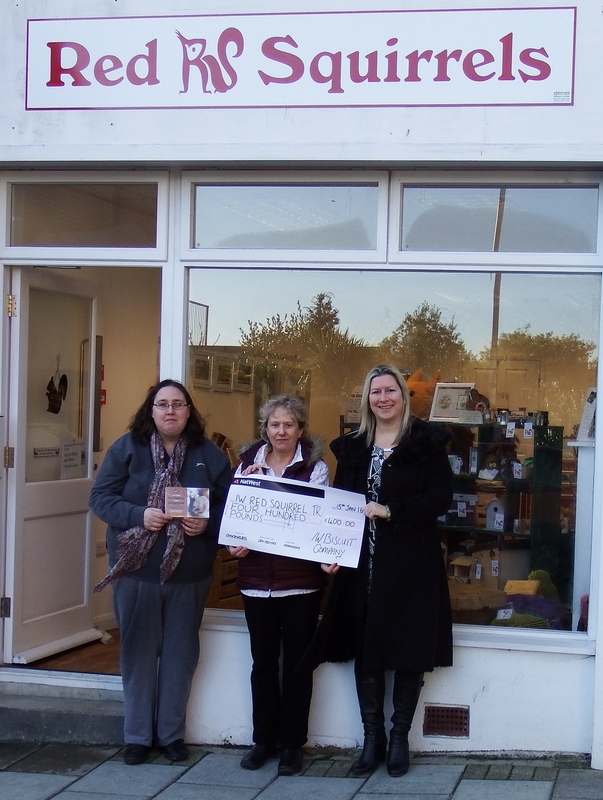 The cheque was presented to Helen Butler at the Red Squirrel shop in Ryde by Kelly Heselton from the Isle of Wight Biscuit Company. Helen was delighted with the donation "this means an awful lot to us. We opened our shop in May and we still need to invest in the shop and we are hoping to set up an online shop this year and this will help us out". The Isle of Wight Red Squirrel Trust help injured, sick and orphaned Red Squirrels all year round. "We are always looking for items to be donated and have lots of ways people can support us" adds Helen "including adopting a squirrel or volunteering for us". The idea to have a Red Squirrel Biscuit came about by a local lady that Helen knew and who came up with the recipe which is still used to this day. "It is one of our most popular products" says Kelly from The Isle of Wight Biscuit Company. "Particularly with visitors to the island who like to support the Red Squirrel Trust and take the biscuits home for family. We are delighted to be supporting such a great island charity".